Less than two weeks after his Comedy Central special “Kyle Kinane: Loose in Chicago” aired, Kyle Kinane brought an entirely fresh set to the stage at The Variety Playhouse in Atlanta, Georgia. Going in to the show, I was a bit concerned that I was about to hear some, if not all of the same jokes that Kinane had used in his recent special. I was pleasantly surprised to find that was not the case. While the topic of his recent diagnosis with gout (a focus on the “Loose in Chicago” special) did come up, he didn’t focus on it. Instead, he turned the show into a totally different direction and regaled us with stories of some of his more embarrassing life experiences. The old saying that “tragedy plus time equals comedy” is a formula that definitely pays off for Kinane’s onstage performance. While many of the stories he tells have a dark bend to them (specifically for Kinane himself), he manages to tell them with just the right flair. He does an excellent job of making the audience laugh at his misery and mishaps, never stopping long enough for anyone to feel sorry for him. 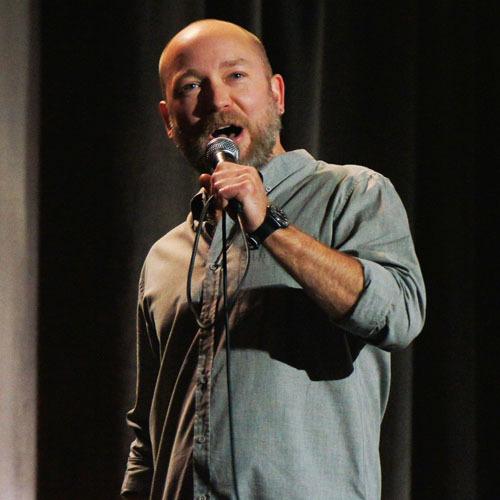 Kinane is a regular on @Midnight and can be heard as the “voice of Comedy Central.” His latest stand up special, “Kyle Kinane: Loose in Chicago” can be watched on the Comedy Central website and the album can be purchased on iTunes. More information about Kyle Kinane and his upcoming shows and projects can be found at his official website.